The mighty Himalayas are the astonishing mountain ranges in Asia. The points below are the facts provide some out of the ordinary facts related to geology about Himalayas. The Hindu Kush Himalayan (HKH) region extends 3,500 km over all or part of eight countries from Afghanistan in the west to Myanmar in the east. The Himalayan mountain range has formed due to continental-continental collision of the Indian plate and the Eurasian plate. The Indian plate undergoes few inches per year below the Eurasian plate. As its a subduction plate boundary, it has a network of reverse faults and duplexes. 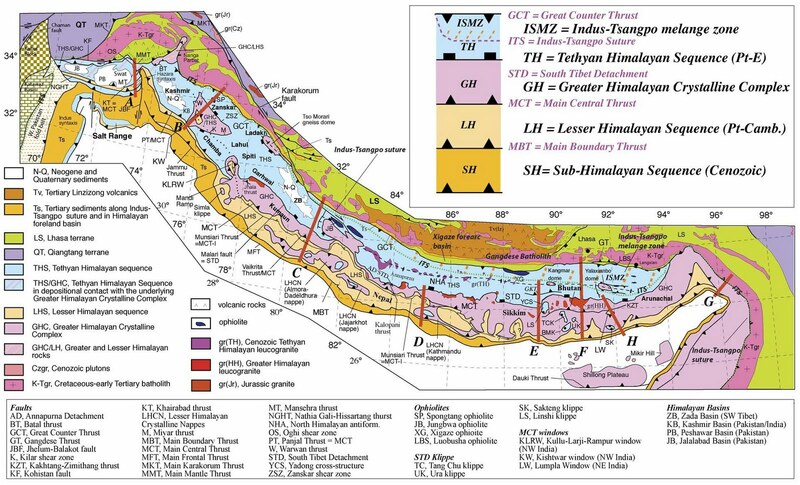 The main reverse faults are The main central thrust, Indo-Tsangpo suture zone, and the Himalayan Frontal thrust. The low angle reverse faults are called thrusts. Remember the 7.7 and 7.8 magnitude earthquakes in nepal, they were the result of the Indian plate subducting and releasing the stress generated. The subduction has resulted the closure of Tethys sea which used to be present between the Indian and Eurasian plate. These rivers provides fresh water, ecosystem services, and the basis for livelihoods to a population of around 210.53 million people in the region. The basins of these rivers provide water to 1.3 billion people, a fifth of the world’s population. They give a negative Bouger gravity anomaly due to their elevation and high mass. The mighty Himalayas consists of mostly Limestone which has been uplifted from the bottom of the Tethys. Scientists at the University of Leeds have solved a 300-year-old riddle about which direction the center of Earth spins. Previous story Deepest volcanic eruption – Recorded!